Our apologies to anyone who tried to stop in or call the Peninsula store yesterday (Wed. Jun. 18). We closed early due to an unfortunate incident that happened up the street. A little before 4pm, a truck hauling a load of bricks lost his brakes while coming down the hill on Rt 303 eastbound. 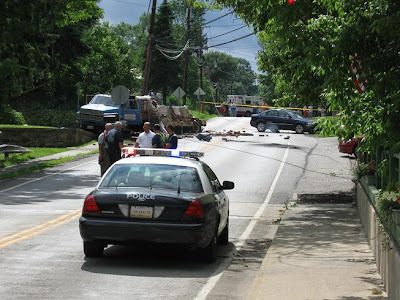 He ditched to the side, spilling most of the bricks on the road, and knocking out a utility pole. Power was out in the whole village for over two hours. The driver was reportedly unhurt. Kudos to the driver for ditching near the top of the downhill. Had he gone farther and had more speed, the outcome could have been far worse (epecially with all the businesses and the traffic light located at the bottom of the hill). Some people may believe its as simple as that- the company is the only one taking the brunt because insurance is at risk. The Velodrome office is right across the street from the accident- I saw it from my desk. The power surge was so strong it melted light bulbs, fried the velodrome's main computer and backup, the printer, blew the microwave, and crossed the circuits of some of my other equipment. It's a setback. So this affects every cyclist who cares about the project- dont know if we deserved this. Yeah, you're right; everyday events have a more far-reaching impact than many people realize. Although I have to be honest, my first thought when it happened was NOT "Oh my God, I hope this doesn't affect the progress on the Velodrome!" Kaleb Kaschalk completes Ironman France! CC on 19 Action News!